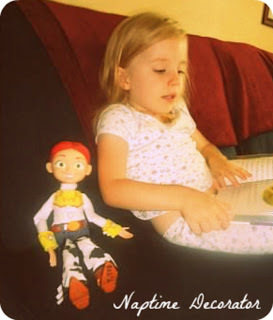 Toy Story’s been a favorite in our house for years. All three of these Pixar delights have always been in a pretty steady rotation, and all three of my kids went through major phases when they wanted Buzz, Woody, and Jessie everything. 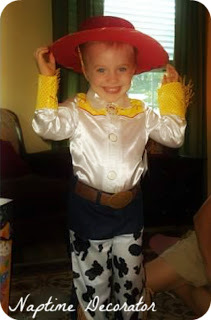 But I think my oldest had TS fever the most. She went through an all-things-Jessie phase, and took her everywhere. And I do mean EVERYWHERE. They were best buds, and my little preschooler looked like this on most days…for months on end. and I remember sobbing – and I wish I could say I’m exaggerating, but I’m not – at the part in Toy Story 2 when they Sarah MacLachlan sings “When She Loved Me.” Poor little Jessie, collecting dust on the floor, watching her buddy gabbing on the phone, painting her nails…leave it to Disney to make us all weep over a toy, right? I remember thinking how sad I would be when that day came. My daughter has started ripping pages out of magazines and taping them on her wall. Show her a picture of One Direction or Taylor Swift and you’ll hear her squeal from 3 states away. And the bookcases that used to store her dolls and My Little Ponies? 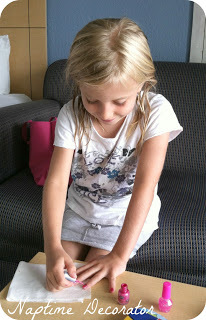 Oh, and one day when I looked over at her when we were at the beach, she was just you know, painting her nails. Like we all do on vaca, right? That’s right. She packed about 7 nail polishes. TO THE BEACH. And the kicker? Don’t even know where poor Jessie is. Oh my word. It’s really happening. One night on vacation, my husband and I were on the balcony just enjoying the quiet, and she walked out to join us. She sat down and just started telling us all about stuff. Who she was excited about seeing when school started, who her favorite band was (1D, naturally)…who her fave GUY from that band was (Harry, naturally- he is adorbs. Girl’s got good taste). How she loves Taylor Swift, and she’d love to go to a concert someday. She went inside after a while (probably to paint her nails again!) and I looked at Paul and we knew exactly what the other was thinking. This is really happening. And I felt an ache in my heart. But I also felt this sense of happiness. This new world we’re approaching together, where we can have these ‘grown-up’ talks, and shop and hang out…it’s so different, but it’s also pretty cool. Who knew?! So I guess what they say about life imitating art is true -or maybe it should be art imitating life?- either way, if you’ve seen the third installment of this Pixar gem, reeeeallly doesn’t bode well for me. I should go ahead and start stocking up on the tissues now. And wine. Yes, I’m pretty sure I’ll need that too.